Recently my husband had a work opportunity crop up in New Zealand. As it was for an extended period of time, I jumped at the chance to relocate the whole family back to our former homeland! Not only was it a fantastic chance to catch up with friends and family, but we’d also be based in Christchurch for the majority of our 6-week stay. I’d spent holidays in Christchurch as a kid, but I’ve never had the fortune to return for a decent length of time with my own family. 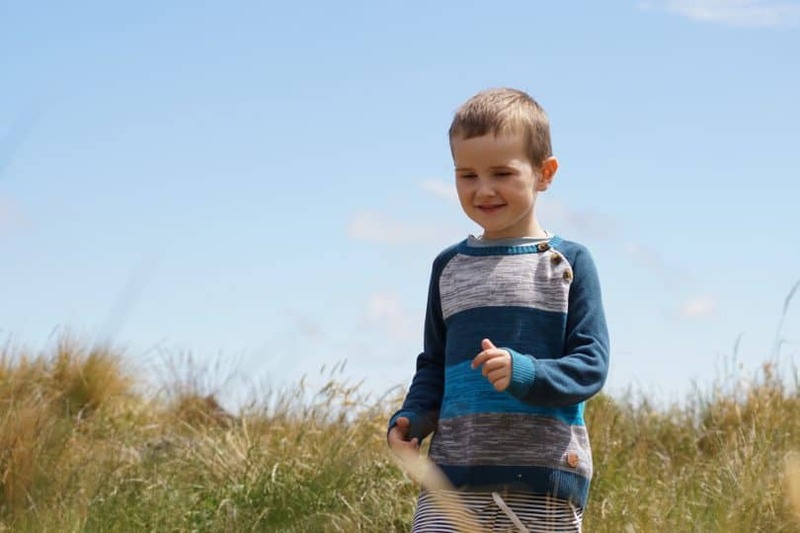 I was excited to share my old favourite haunts with my 4-year-old son, and discover all the new things to do in Christchurch for kids too! Whether you’re heading to the Garden City for a weekend or an extended holiday, there are so many things to do and see in Christchurch that you’ll be pushed to fit them all in. Here are some of my favourite Christchurch attractions. And if you’re looking for cheap and free things to do in Christchurch – there are plenty of these included too! 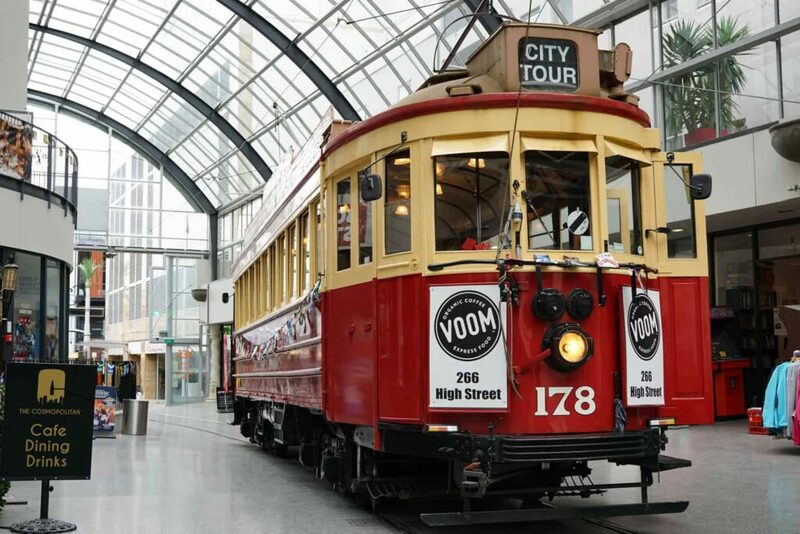 Hop on board one of Christchurch’s heritage trams to explore the city from a unique vantage point. The Christchurch tramway weaves through the city, down streets closed to other vehicles, and past some of the city’s key attractions such as the iconic Re:START Mall, Cathedral Junction, the Avon River, Gothic-style Arts Centre, and New Zealand’s most beautiful street – New Regent Street. 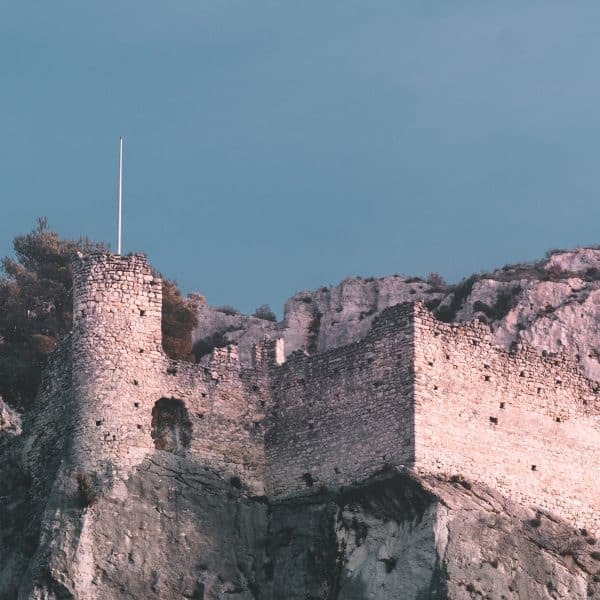 It’s a kid-friendly attraction with an ongoing narrative of the sights and history of the area. In our experience, the tram drivers are friendly and engaging. Our driver went as far as showing our son how the controls work and letting him pull the tram bell! Riding the Christchurch tram is an excellent way to see the city without little legs getting tired. Hop on and off as you please, stopping to explore as you go. Book your tickets here and save queuing up on the day! Tip: Jump off at stop 12 to explore the Canterbury Museum and Discovery kids area. 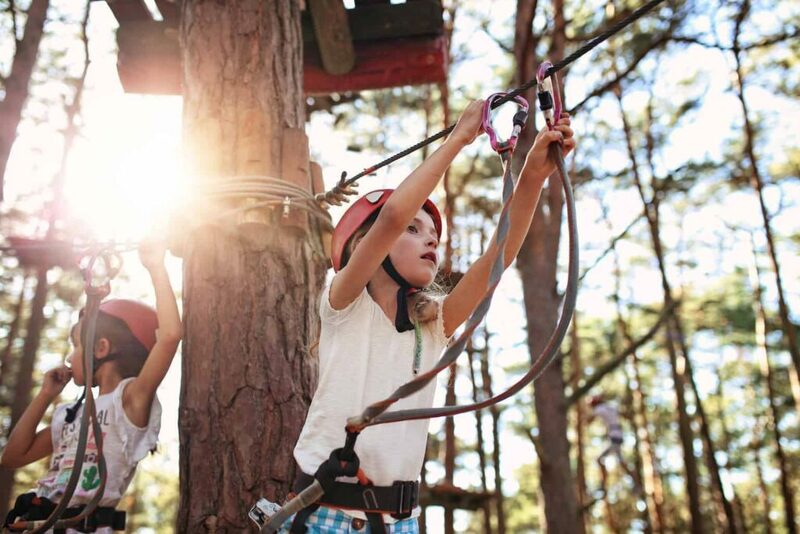 One of the best things to do in Christchurch for older kids, Adrenaline Forest will keep adventurous families busy for hours! Make your way up wonky wooden ladders, zip line between the tree trunks, stretch your stride on the rope bridges and teeter on tightropes as you’re put through your paces. The park is constructed of courses that are designed to challenge you both physically and mentally. There is no minimum age to enjoy Adrenaline Forest, but younger visitors must be at least 130cm tall. Children between 1.30m – 1.45m can enjoy the first two pathways. While the rest of the course is open to anyone taller than 145cm. Book your tickets for unique family fun here. A short 15-minute drive from Christchurch city will see you in the quirky portside town of Lyttelton. The town itself is well worth a stroll, as it’s brimming with boutiques selling locally made art and delicacies. But we all know how much kids like shopping, so a better idea to keep little ones happy is to jump on a ferry to Quail Island. Ferries depart Lyttelton mid-morning and return mid-afternoon, leaving you just the right amount of time to walk, explore and enjoy a picnic lunch on the island. Quail Island is uninhabited and it’s a great place to discover at your own pace. Kids will love passing the island’s shipwrecks, former leper colony and early European quarantine station. Stop to swim and build sandcastles on the island’s beaches and keep an eye out for NZ’s native birds who call the island home – including the white-flippered penguins. Gently winding up and down the side of Mount Cavendish in the Port Hills you’ll find the Christchurch Gondola. Cable cars are a huge hit with kids of any age, and Christchurch’s gondola is a fun way to get a different perspective of the city. 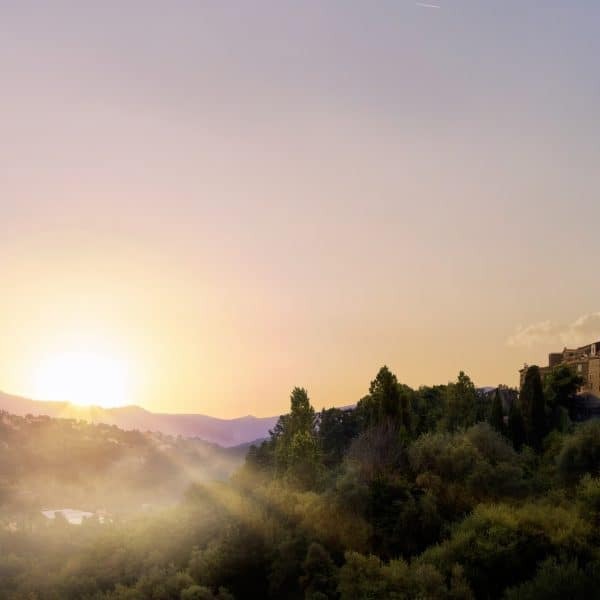 If you’re feeling active, climb to the top using the dedicated walking track and take the gondola back down! But this Christchurch attraction isn’t limited to the ride itself! 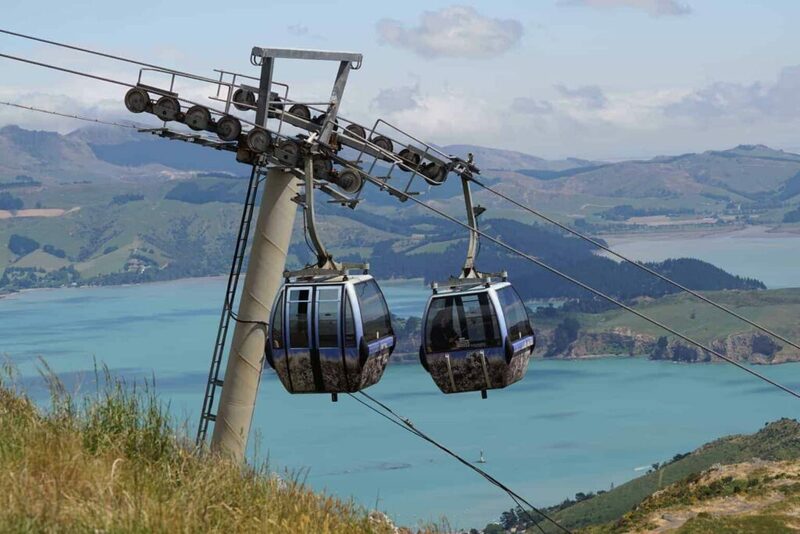 At the top, you’ll find a breathtaking view of Lyttelton Harbour and the alpine mountains, an on-site cafe serving classic kiwi favourites, summit trails, and a gift shop. But the winner for kids is the ‘time tunnel’. Hop on a cart and explore Christchurch through the ages with this entertaining ride at the top of the Gondola! Book your gondola tickets here. Ask any kid from the 80’s about the best things to do in Christchurch, and undoubtedly Orana Wildlife Park will come up. Like many others, I have childhood memories of driving through Orana Park in our car as lions would swipe at our wing mirrors and jump on our roof! Due to modern common sense health & safety rules, you can no longer drive through the lion enclosure. But you can still get up close to the big cats in the back of a caged off 4WD. I’m not normally a fan of Zoos, preferring instead to see animals in their natural habitat. But Orana Wildlife Park is a zoo like no other in New Zealand. Firstly, it’s New Zealand only open range zoo. Set in 80 hectares, the animals have much more space to exhibit natural behaviours. Secondly, it’s backed by the Jane Goodall Institute of New Zealand, a partnership that reflects the park’s commitment to conservation, education and advocacy. Everyone will have a great day out at Orana Wildlife Park. Take part in the many animal presentations throughout the day, play at the well-maintained playground, meet NZ’s only gorillas and orangutans, and take a break at the onsite cafe. Quake City is an interactive museum dedicated to the 2010 and 2011 Canterbury earthquakes that devastated Christchurch. It’s both an inspiring and educational exhibit, as you learn all about the science behind earthquakes, right through to the city rebuild efforts that are continuing to this day. While Quake City isn’t a child-focused attraction, it has interactive exhibitions that make the experience an informative and fun visit for the whole family. I would recommend it for older children who can read, and who can appreciate the scale of the earthquakes. Alternatively, younger children are provided with a Lego table to keep them busy. And it’s just a 5-min walk from the family-friendly Hotel Montreal! 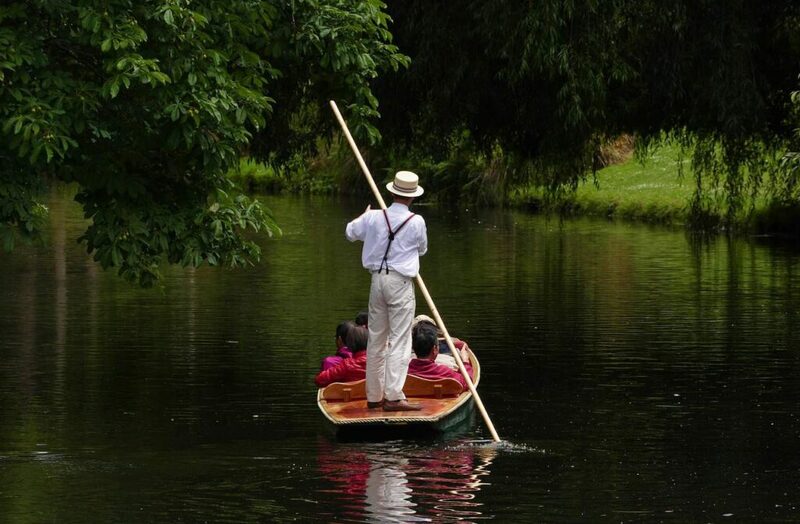 Punting down the river Avon is such a fun way to discover the garden city as you glide down the winding river on an Edwardian flat-bottomed boat. An iconic Christchurch experience, the ride will take you under weeping willows, through the botanic gardens and past the serene spaces of Hagley Park. Sit back and relax as all the work is done for you. Kids will love the novelty of the ride, and it’s short enough to hold the attention of even the littlest of passengers. Take some birdseed to sprinkle in the water, and watch as ducks come rushing up to the boat for their share. Check prices and book your Avon River punt here. One of our favourite things to see in Christchurch, the International Antarctic Centre is an awesome day out that your kids will love! Located right next to the Christchurch airport, this interactive attraction takes you on a magical journey to Antarctica, minus the prohibitive logistics. Experience an Antarctic storm, ride in a real-life Hagglund, feel the thrill of an Antarctic cruise through the simulated 4D experience, and watch the rehabilitated little blue penguins at feeding time! Any adventurer will have hours of fun at the International Antarctic Centre. Book your tickets here. The Halswell Miniature Trains are a hidden gem in Christchurch. 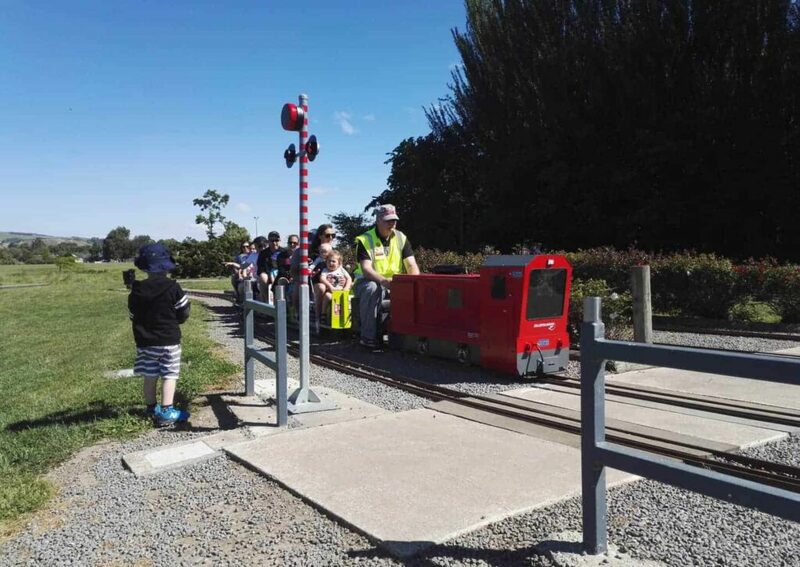 Located southwest of the city in the Halswell Domain, every Sunday afternoon you’ll find a dedicated group of train enthusiasts driving miniature trains around a looping track. A fantastic activity for younger children, they’ll be thrilled to ride atop these amazing replica trains as they puff and chug around the park. Halswell Domain also has a small lake where model boats are sailed on the 2nd Sunday of each month, plus playgrounds for both toddlers and older kids, making it a great destination for a family day out. Willowbank Wildlife Reserve is a fantastic family-friendly venue, offering little ones the unique opportunity to get up close to New Zealand’s native birds, feed wild eels and learn about animal breeds that are unique to NZ. During the school holidays (for an additional charge), kids can step into the shoes of a Keeper and experience what it’s like to care for the animals in this important role. A trip to Willowbank isn’t just a fun outing though, it’s also the best place to see kiwis in New Zealand. It boasts the country’s largest and most accessible kiwi viewing area, where seeing a kiwi is guaranteed! 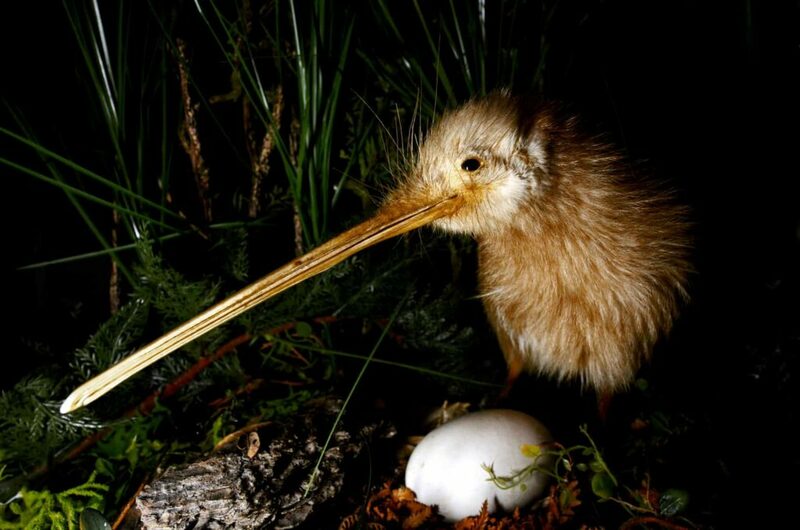 The team at Willowbank are dedicated to the conservation of New Zealand’s kiwi population, by running a breeding programme that sees kiwi eggs incubated at Willowbank and released back to crèche sites in the wild. Most towns in New Zealand have their own toy libraries – and Christchurch is no different. 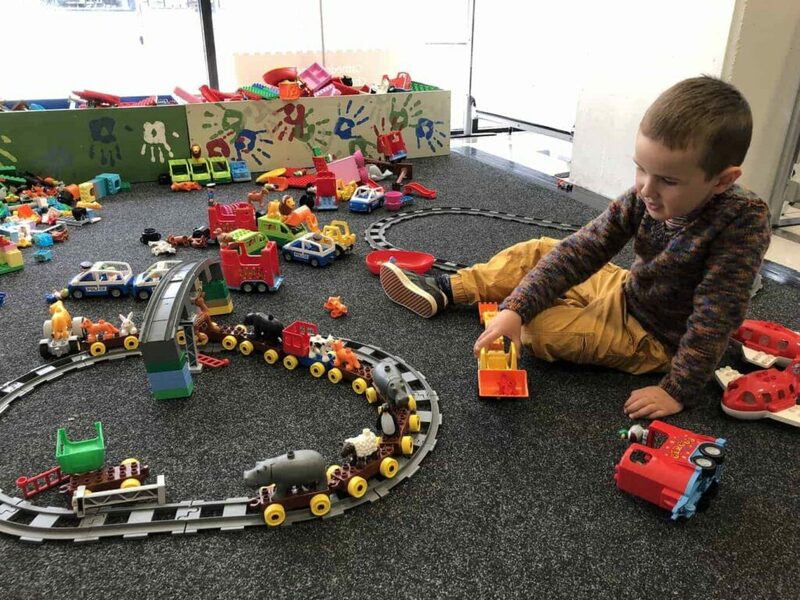 Toy libraries offer you the chance to leave the toys at home on your next trip to Christchurch and load up on fun new games and activities for a small rental fee. Renting toys from a toy library normally involves paying a small bond (around $20 which you get back when you close your membership), and borrowing toys for around $1 – $5NZD each. Proof of address is required to sign up, but the toy library near where we were staying had no problem accepting that we were temporary visitors to the area with no fixed address. Money Saving Tip: You can book combo tickets for Christchurch’s attractions for less! Check out some popular combos below. I remember visiting the Airforce Museum as a kid, and it’s still a very popular Christchurch attraction with children today! Take a journey through time as you explore New Zealand’s military aviation before, during, and after WW1 and WW2. 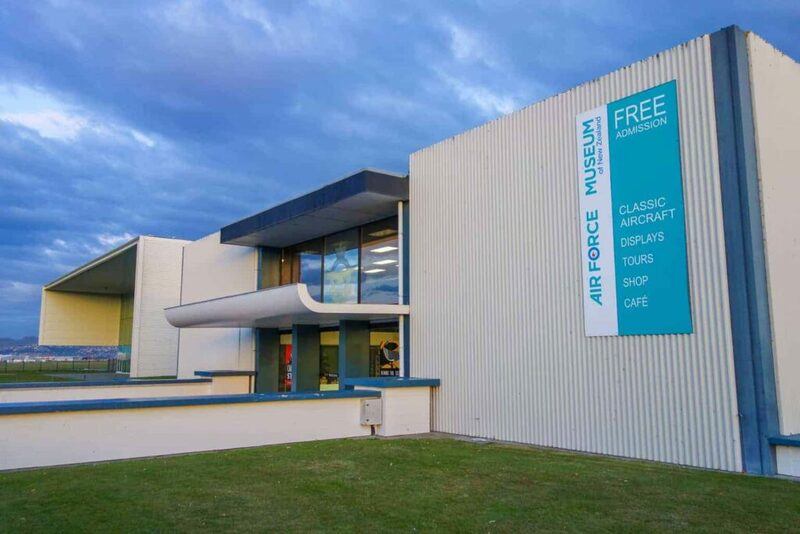 Children will be entertained by the immersive exhibitions, the free 30-minute Behind the Scenes tour, getting up close to the real military planes, and testing their flying skills in the Mosquito Mission flight simulator. Entry to the museum is free, and there’s plenty to keep older visitors occupied too! Have you got kids that love scooters and bikes? A trip to the Westburn Reserve bike park is bound to be a hit! A safe place to let younger kids ride through a realistic course of streets, roundabouts and intersections – without the worry of traffic. It’s the perfect place to teach kids the basics of riding their bikes, road rules, and signalling, before letting them loose on real roads. There’s also a small playground and picnic area to enjoy. Westburn Reserve has been a favourite with Christchurch families for years, but it’s still relatively unknown to most visitors. Christchurch’ botanic gardens are one of the most beautiful places in Christchurch, and a must-do for anyone visiting the city. Stroll through multiple rose gardens, a herb garden, rock garden and water garden, or wander through the fernery. Kids will have plenty of fun running around the gardens, feeding the ducks or trying to find treasures among the trees. And there’s also a dedicated kids area with a large playground and picnic areas. During the summer months, there’s even a fantastic paddling pool for the little ones to cool down in – a favourite among the locals! The gardens are spread out over 21 hectares, so I’d recommend taking a ride on the electric ‘hop on hop off’ trains if you want to make the most of your visit with kids. What better place to let the kids loose than on a wide open beach? 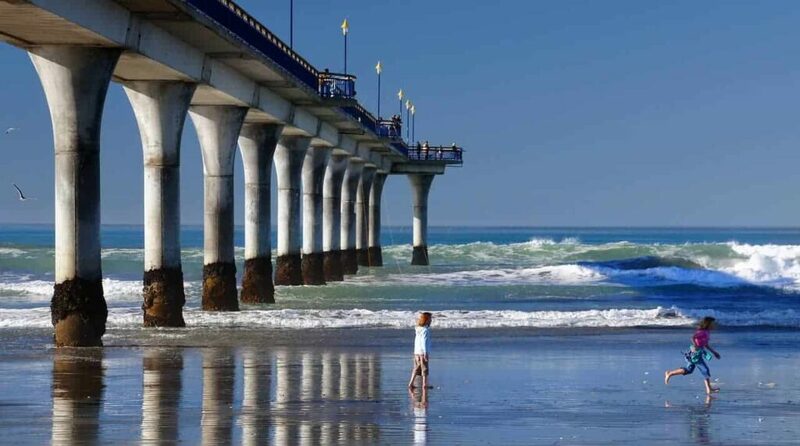 There are several great beaches in Christchurch, New Zealand – perfect for building sandcastles, flying kites and swimming in the summer months. My favourites are Sumner Beach and New Brighton Beach, but there are plenty of other beaches near Christchurch. So grab your jandals and get ready for some good old fashioned kiwi fun! The playgrounds in Christchurch are among the best we’ve seen anywhere on our travels. 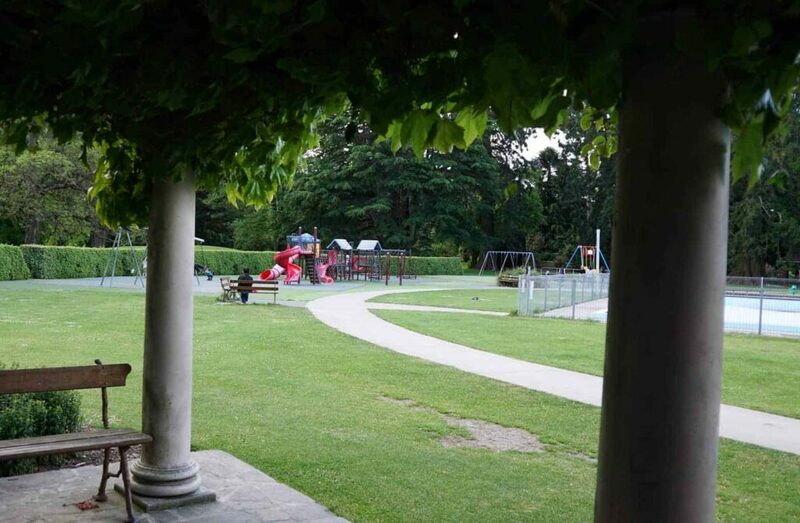 Head into the central city to experience one of the most famous things to do in Christchurch with kids – the Margaret Mahy Playground. 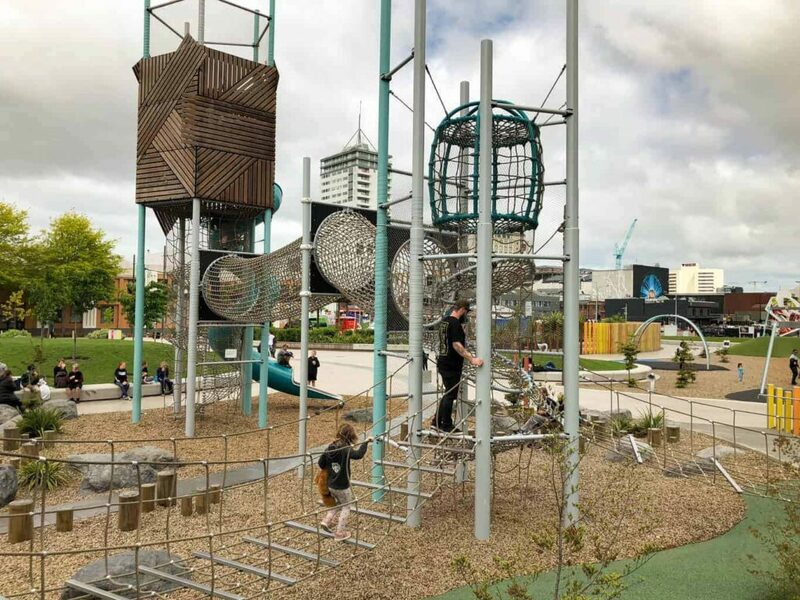 Opened in December 2015, the Margaret Mahy playground is a park like no other. Filled to the brim with exciting activities including water play, flying foxes, climbing walls and rope courses, kids will have hours of fun working their way around the largest playground in the southern hemisphere. But the fun doesn’t end there. We found fantastic playgrounds tucked away in every corner of Christchurch. Amazingly, there are almost 300 playgrounds in Christchurch! Find your closest playground here. For those staying outside of the city centre, the nearby towns of Lincoln and Rolleston boast their own destination playgrounds. The Canterbury Museum is one of the best things to do in Christchurch. Visitors from all around the world will be enthralled by exhibitions telling of the history and heritage of the region. You’ll be taken back in time as you walk through a life-sized replica of a typical nineteenth-century Christchurch street – complete with shop displays and the background noise of horseshoes clip-clopping through the town. Kids are particularly well catered for in the Canterbury Museum, with their very own Discovery Centre. Discovery is ideal for kids aged between 3 and 13 and is full of fun educational activities such as digging for fossils and getting up close to realistic animal models. Although entry to the museum is free, entrance to Discovery costs $2. Imagination Station is the perfect pit-stop for any Lego loving kids! Let their imaginations go wild as they create masterpieces with the massive array of Dulpo, Lego and Technic pieces available. For those who like more structured building, there are also idea stations – where kids can create based on specific requirements or plans. Remarkably, this is a free activity in Christchurch, although if you can afford to make a small donation, it is always appreciated. 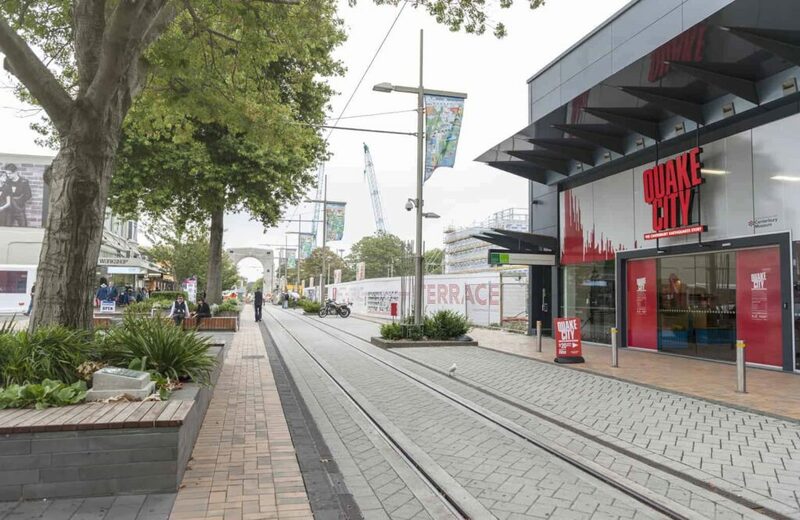 Imagination Station is located right near the Christchurch tram depot – so you can combine two great things to do with kids in Christchurch! Christchurch provided our family with so many opportunities for fun and exploration. Some new attractions, and plenty of old family favourites. Which of these top Christchurch attractions have you visited? P.S If you’re looking for things to do around Christchurch, check out my post on swimming with dolphins in Akaroa – a short 1-hour drive away! I love this article! My husband will be on a work assignment in Christchurch and I will visit with our three kids for a month in the summer, traveling from our home in the USA. Im looking forward to checking out these activities!